Phones and tablets can do almost anything these days – they’ve replaced everything from music players and encyclopedias to train tickets and phonebooks. But there’s one thing they still fail to do: to stay on when you need them. The crowd funded premium solar charger Solartab aims to solve this problem once and for all, and to do it the environmentally friendly way. This summer, chances are you’ll find yourself in surroundings where the nearest power outlet is miles away. If you want to make sure your energy hungry phone or tablet always is ready for action at the beach, picnics in the park, music festivals, or even a tent in the middle of the woods or a deserted island, Solartab might be just what you’re looking for. And unlike your regular solar charging solution, the innovative new product even provides energy after sunset. The Solartab is big enough to charge all your mobile devices, like your phone and tablet, but it’s also compact, portable and stunning looking. 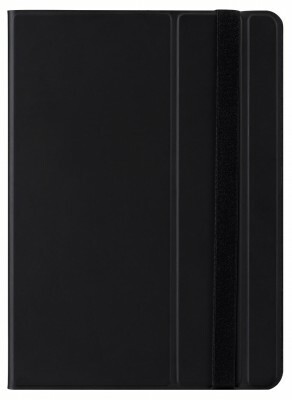 Featuring a strong 5.5W solar panel as well as a high-capacity 13000 mAh solar panel, Solartab always provides two options for keeping your favorite gear from the likes of Samsung and Apple charged up and ready to go: Charge them directly from the sun, or from the battery if you happen to be indoors or the weather is cloudy. With two USB 2.1A outputs, charging both your tablet and phone at the same time is also possible. The Kickstarter funded team behind Solartab promises that it will always charge at maximum efficiency as long as the sun is up. To keep this promise, they not only increased the solar panel’s size way beyond what you’ll find on the average portable solar charger on the market today, but also included an innovative built-in cover. The cover works as a stand for the solar panel, allowing you to angle the panel in three different positions depending on the sun’s current whereabouts. And even more impressively, tech enthusiasts can charge their beloved touch-screen gadget even while they’re listening to their favorite summer tune, or browsing the Internet, at the same time. 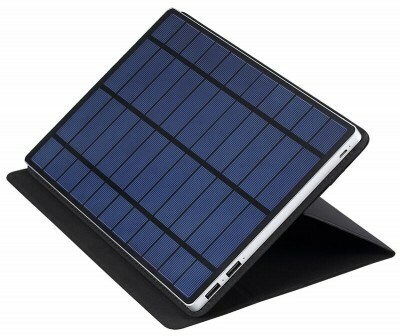 Finally, a solar charger that you can truly count on! Solartab is about the same size as an iPad and features a sleek, clean design. When opened and in action, the product looks rather futuristic, but when folded together and wrapped in its nostalgic looking cover, it instead resembles a stylish diary that could easily slip unnoticed into your bookshelf. Judging by the absolutely incredible response the product got on kickstarter.com last year, the public out there seems to agree. Now the product has been shipped to its crowdfunding backers, and the startup company is accepting further orders on their own website mysolartab.com.